Those who go to work in an office for the first time can often get a surprise and how much laughing and camaraderie exist there. Yes, there are times when it is quiet and serious but on the whole everyone is pulling together for the both the good of the company and to ensure their continued employment. There is nothing like a workplace for in-jokes either that those outside simply don't get, and in the same vein, you can relieve those childhood class room days where you used to pass notes around when the teachers back was turned and snigger behind your hands. Now, instead of scraps of paper it is ecards that fly around the office like wildfire thanks to the fact they are sent electronically, Sure, you can send an email if you want but these are just so much more fun. Take the run up to the new financial year for example, when everyone is wondering if there is a pay rise in the offing. 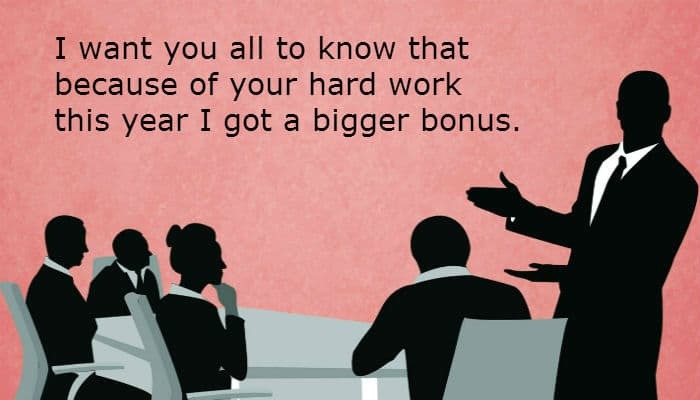 These Bosses Bonus corporate ecards have a pink background and silhouettes of a meeting. One is standing up speaking, clearly the boss, and the message reads “I want you all to know that because of your hard work this year I got a bigger bonus”. Office humour par excellence. If your business sends out Christmas cards to clients then you absolutely must spare 5 minutes to see our amazing e Christmas cards for business.